CNPS-San Diego presents four special events each year. 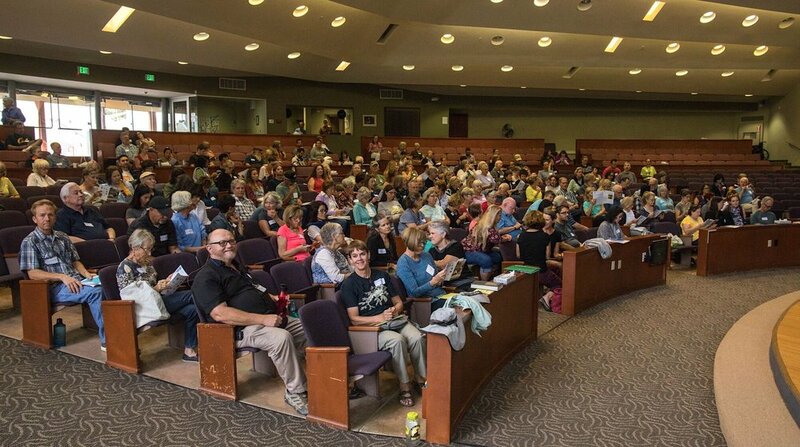 People travel from all throughout Southern California to attend these events and the events go far in educating, motivating, and inspiring the public to garden with California native plants. To find more detailed information about these events, check our Upcoming Events section of the website. Sign up with your email address to be the first to hear about special events, early-bird ticket offers, and related news. We respect your privacy. Subscribers to Special Events will only receive emails in this category. Thank you! You will be the first to receive details of any upcoming Special Events. Held each year during the weekend of April 13-14, the Native Garden Tour is a self-guided walk through private and public gardens in a geographical area of San Diego County. • Self-guided tour of private gardens, with each garden staffed by knowledgeable volunteer docents and homeowners. Additional public and commercial gardens are available as stops on the tour. A Winter Workshop: “Create Habitat and Give Back to Nature with California Native Plants” is scheduled for January 26, 2019 at the Museum of Photographic Arts in Balboa Park. Our next Fall Workshop will be held in September. After a day of presentations from numerous experts speaking from all angles on the subject, participants across the county have been inspired to plant or make improvements to a native garden. Our Fall Plant Sale, held in mid-October in Balboa Park offers thousands of native plants for purchase. The sale coincides with an optimal time of year to put native plants in the ground. Expert advice is available at the sale, along with literature, seeds, and native plant swag. The Fall Plant Sale is virtually a yearly homecoming for CNPS-SD members, visitors, and friends.